The BlackBerry Z10 is one of the hottest new smartphones on the market. But does it stack up to THE hottest modern smartphone? CIO.com's Al Sacco highlights 10 things the BlackBerry Z10 can do that Apple's iPhone cannot. The first BlackBerry 10 smartphone, the BlackBerry Z10 is now available in the United States, and overall, it has been relatively well-received - in North American and overseas. The device just went on sale last week, and U.S. wireless carriers have not yet released any official sales numbers. But if non-U.S. shipments during the first couple of months following the Z10's release are any indication, BlackBerry may see even more Z10 shipments than the million devices it moved it in the company's fiscal fourth quarter. One solid sign that the Z10 is getting some attention in the United States is the number of inquiries I'm currently receiving from readers, colleagues, coworkers, friends and family about the Z10. The inquiries usually go something like this: "You have the new BlackBerry, right? [Insert name of somebody they know here; Joe Schmo, for example] has one too, and he really likes it. But I don't know if I can switch from my iPhone. I'm due for an upgrade, but the new iPhone is coming out soon, and I might just play it safe. What can the new BlackBerry do that my iPhone can't?" I hear from a lot of Android users, too, but more people I've spoken with use iPhones. So for the purpose of this article, I'm going to stick with a BlackBerry Z10 v. iPhone comparison. Instead of repeating the same ol' spiel to everybody who asks about why they should buy the Z10 instead of a new iPhone, here's a quick list of things the Z10 can do that the iPhone can't. Before I get started, I'll state that this post is in no way saying the BlackBerry Z10 is "better" than the iPhone. You should do a lot more research before buying a new phone than just reading one article. With that said, here's a list of 10 BlackBerry Z10 features that you will not find in any iPhone. One of my single favorite features found in the BlackBerry Z10 smartphone is the HDMI-out port, which lets you easily connect your device to any TV, monitor or display with an HDMI-in port. The HDMI support lets you watch HD video, stream music or share anything else on your device by mirroring its screen on your HD display. 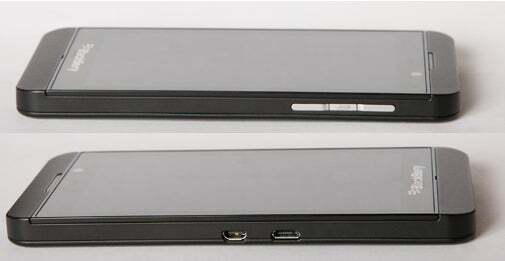 HDMI-out support is not an exclusive BlackBerry Z10 feature; a number of Android phones from Motorola have micro HDMI ports. But you won't see any such port on any Apple gadget. 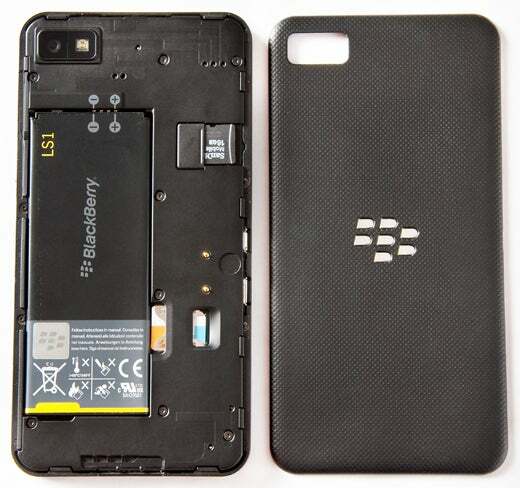 Unlike any of Apple's products, the BlackBerry Z10 has standard charging ports. That means you can use any microUSB power cord or sync cable you may have on hand. And you get access to a larger number of third-party accessories that aren't necessary built just for the Z10 and, therefore, are often cheaper than Apple-specific cords and accessories. An awesome new camera feature in BlackBerry 10 is the TimeShift camera setting, which helps you capture better pictures of groups of people - particularly children, who may have trouble sitting still. TimeShift takes a rapid series of images and lets you isolate the faces of the subjects in your photos. You can then tap the faces in the picture and "fast forward" or "rewind" them to find the best facial expressions. TimeShift is unique to BlackBerry 10 - you won't find anything like it built into iOS or Android - and it works very well. The BlackBerry Z10 supports microSD memory cards up to 64GB, which boosts the device's overall storage capacity to 80GB at a time. (The Z10 only comes in one 16GB model.) I use one 64GB memory card in my device, and I carry around another pair of 64GB cards for a total of more than 200GB of storage at any given time. I have a massive music collection, and I can fit almost all of it on these three media cards. I could also carry additional memory cards if I wanted more storage space. The iPhone doesn't support expandable storage, and the largest storage capacity for iPhone is 64GB. Even more valuable than support for microSD media cards is the fact that you can swap out the BlackBerry Z10's 1800-mAh battery. I have yet to find a single smartphone that will last a full day of travel, with heavy use, without charging multiple times. That's why support for removable batteries is an absolutely necessity for meanyone who travels frequently. Spare Z10 batteries can be purchased for less than $25 each on Amazon.com. And BlackBerry offers a cool Battery Charger Bundle that comes with a spare battery and a charging dock for simultaneously powering up your Z10 and an extra battery. The BlackBerry Z10 and its BlackBerry 10 OS may have only a fraction of the applications as iOS, but the Z10 can run not only native BlackBerry apps, but also repackaged or "ported" Android apps. Some official versions of ported Android apps are available in the BlackBerry World app store, but many more can be found online and then manually sideloaded onto your device. You can even repackage your own Android apps if you're willing to put in time and effort - though not all apps will work the way they do on Android. The quality of Android apps on BlackBerry 10 varies widely, depending on the complexity of the apps and how much effort the developers put into making them BlackBerry 10 compatible. But support for Android apps provides BlackBerry 10 users with a wider base of applications while BlackBerry improves developer support and builds its catalogue of quality native BlackBerry apps. I know of some screen sharing software for iOS, but BBM screen sharing lets you quickly switch back and forth between sharing and a video chat, and you can continue your voice chat while sharing your device's display. My single favorite feature in BlackBerry 10, and on the Z10, is the virtual keyboard. It's the best touch-screen, virtual keyboard I have ever used, hands down. When it comes to accuracy, ease of use and predictive-text features, it puts the stock iOS keyboard to shame. The on-screen keys are large, and the keyboard's rows are separated by virtual "frets," which add some space and provide more touchable area per key. The keyboard literally "learns" your typing behavior and adjusts accordingly. For example, if you have large hands and you constantly hit the "P" key when you're trying to tap the letter "O," the keyboard learns your pattern and adjusts itself. The BlackBerry 10 keyboard's predictive-text features are what truly set it apart from other touch-screen keypads. When you start typing, the software predicts what it thinks you'll type next. But unlike other keyboards, the predicted words appear directly above the next letter in the word you're typing. To finish the word you just slide your finger upward from above the letter you're on. The Z10 virtual keypad also takes predictive text a step further. In the past week, I've send a lot emails to PR people and sources, and I closed many of these messages with a standard: "Thanks very much for your assistance." Now, when I start typing "Thanks," on my Z10, it not only predicts that word, but "very" automatically appears above the "V" key. And if I slide my finger up to type "very," the word "much" appears above the "M" key and so on. The heart and soul of BlackBerry 10 is the BlackBerry Hub, and it's a standout feature. The BlackBerry Hub shows all of your messages and notifications in a single place. And you can easily access it, when you're using a specific application or while you're navigating home screens, by sliding your thumb up from the bottom of the display and then to the right, to pull the active page to the side and "peek" at your Hub. If you want to open a message or notification you just continue your thumb's leftward motion until the Hub takes up your entire display and click on the message or notification of your choice. If there are no pressing messages, you can slide your thumb back to the right and return to whatever you were doing. BlackBerry Hub also lets you filter messages and notifications so you see only the items you want. For example, when you're in the Hub you can pick Email to see only email messages, or you could choose Facebook to see only messages and notifications from Facebook Friends. Developers can build applications that integrate with the Hub, and the more Hub-compatible apps you use the richer the information you find there. BlackBerry Hub is unlike anything in iOS, and though it takes some getting used to, it works very well. BlackBerry 10 can keep up to 8 applications running at one time, and each app is represented with its own Active Frame that appears on your main home-screen pane. Active Frames are dynamic windows that update themselves periodically with new information. Different apps provide different levels of information via Active Frame, depending on the software's integration with BlackBerry 10. But a deeply integrated app can provide a wealth of information just by viewing its Active Frame. A couple of examples: The Active Frame for the BlackBerry World store rotates through popular and spotlighted apps, noteworthy films and music to show you what's hot at a given time without actually opening up the app store; and the BeWeather 10 app shows rotating weather information and graphics for your pre-set locations in its Active Frame. BlackBerry Balance is a technology built into the BlackBerry 10 OS that lets IT administrators create two separate personas on your smartphone: one for work; and one for personal. While Balance sounds like a feature designed specifically for IT, it also benefits users because it keeps all personal information separate from corporate data, so IT never has to access personal files - or delete them in case of a security scare. Balance couldn't be more unobtrusive for the user, so it doesn't affect the overall experience. And it provides piece of mind for both IT and Z10 users. BlackBerry recently announced Secure Work Space features that will bring Balance-like dual personas to iOS and Android, but the security features won't match those available via BlackBerry 10 and BES 10. And the user experience will likely be less smooth.